The excitement of planning and packing. All of the unfamiliar sights, and sounds, and smells. Jet lag, language barriers, traveler's…stomach troubles. Once you've reached your destination, it can all be pretty overwhelming. You want to make sure to come away with something more than the same old travel snapshots all the other tourists are taking. Here's a handy travel photography shot list, with 27 tips to keep your creativity flowing. With plenty of ideas, from including a human element in your photos, to searching for unique perspectives, to incorporating video in unexpected ways, this list may be the most important piece of gear you take with you! (Ok, your camera is up there, too). to lay in and try to capture the sunset. However, only very devoted photographers will brave the early wake-up call for sunrise. 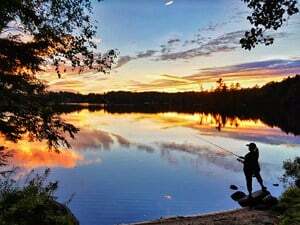 Bodies of water that tend to be choppy most of the time are most likely to be still and glassy in the early morning, making for great reflections. Bonus points for adding the human element, and capturing people watching the sunrise. For those super early, summer sunrises, you may have to supply your own people at less frequented locations! Silhouettes can be very dramatic. Make sure that any people in the photo have good separation between their limbs and bodies, so they make recognizable shapes. Photo by Tracy Munson. When you're photographing a new place, it's REALLY helpful to use the Really Good Photo Spots app for the iPhone. The app has THOUSANDS of great photo spots to shoot all around the world. Get the Really Good Photo Spots App here. It's a free app with some really cool premium features if you want to upgrade for a few bucks. This is one I personally forget about all the time. I'm always bracketing my shots for future exposure blending and properly exposed highlights and shadows. Sometimes it's much more dramatic just to let recognizable shapes fall into darkness and make a silhouette. This technique can be a great way to get interesting shots on one of those dreaded, sunny, blue-skied days! It also works great when photographing people watching the sunrise. One of the most interesting things about traveling in other countries is seeing the differences in how people live. From Mongolian Yurts to reed huts on floating islands in Peru, once you leave the land of McMansions, you'll be amazed at the unique and creative ways people have found to build dwellings that suit their environments. Showing a local person, outside of a typical home in the area is a great way to make your picture really be worth a thousand words. 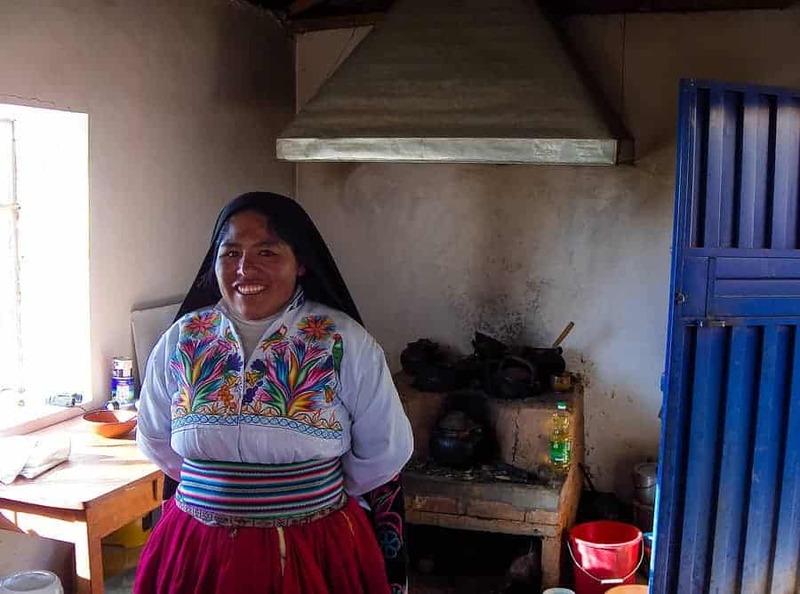 A Peruvian woman in her kitchen. Photo by Tracy Munson. When photographing a landscape, show how you got there. Show your canoe and paddles at the shore. Photograph your snowshoes or skis, stuck standing up in the snow. Include your campervan or bike in the frame. 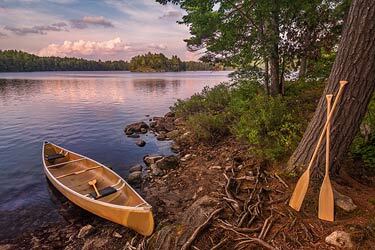 A yellow canoe, with paddles propped up against a tree at our back-country, island campsite on Cold Lake in Kawartha Highlands Provincial Park, Ontario. Photo by Tracy Munson. 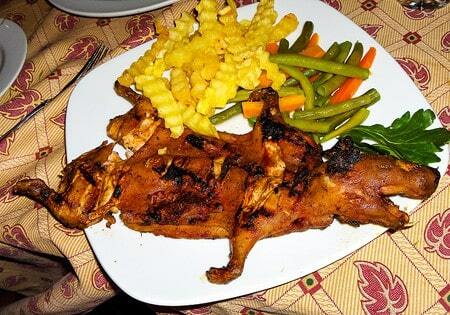 A Guinea Pig dinner in Peru. I didn't order it, don't blame me. Photo by Tracy Munson. It's truly mind-boggling, if you think about the diversity of food humans eat, across different cultures. Food can be one of the most instantly recognizable symbols of a place, and you shouldn't miss the opportunity to document it. Photograph the sushi in Japan, the pasta in Italy, the wine and cheese in France, and the lobsters in Maine. 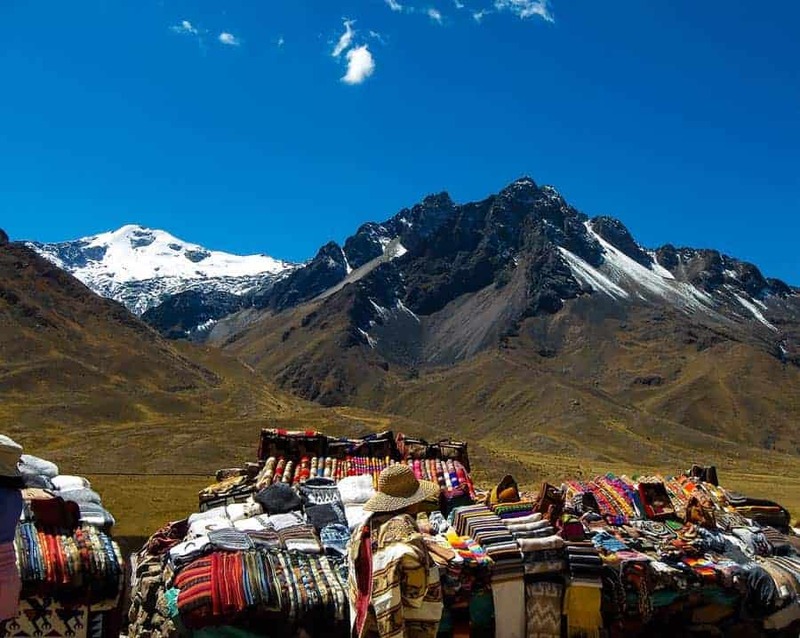 Colorful woven goods at a roadside market in Peru. Photo by Tracy Munson. If you're lucky enough to be visiting another culture at a time when there are festivals or parades happening, you will be spoiled for subjects. A little research ahead of time will help ensure you don't miss an opportunity. Fortunately, people love to celebrate, and you can usually find something going on, wherever you visit. 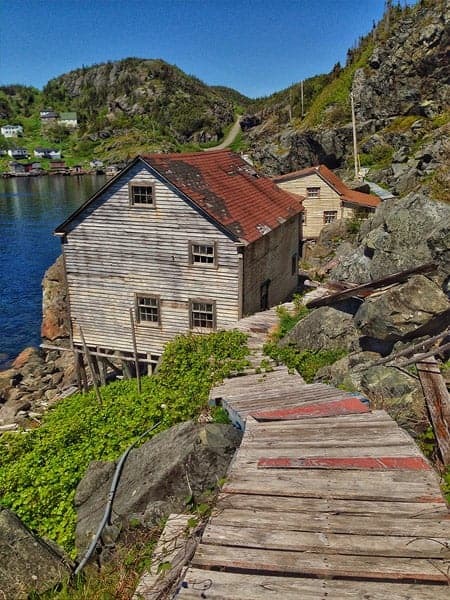 Places like this abandoned fishing village in Newfoundland are windows into the past. Photo by Tracy Munson. Sometimes, the abandoned places can tell us as much about an area as the crowded ones do. Whether the cause was the collapse of industry or a natural disaster, there is always a story when people leave a once inhabited place behind. A Cinemagraph is a still photo with motion only in selected areas. If you don't know what I'm talking about, check it out now, I'll wait. They are so surreal and eye-catching…sometimes even startling. You can make your own Cinemagraphs using the Cinemagraph Pro app (formerly Flixel) on iPhone, iPad or Mac. All you need is a tripod and a camera able to shoot short videos. While you've got your tripod set up, why not create a time-lapse? If you have lots of time, you could shoot the sun setting and the stars coming out. If you have less time, try shooting a shorter time-lapse of a bustling marketplace or cars zipping past a busy, downtown intersection. Many DSLR's have built in time-lapse capabilities, as do Go-Pro cameras and most cell phones. If you don't have the time or inclination to set up on a tripod, try the Hyperlapse app, which has amazing image stabilizing abilities, allowing you to make a handheld time-lapse, even while walking or driving! Of course, you brought your neutral density filter along for waterfalls and moving clouds. Don't leave it behind in your hotel room when you go out in the city! Slow people and cars down to blur them and create a sense of motion. With a ten stop ND, you may even be able to take a long enough exposure to make the bustling city streets appear empty, for a surreal, post-apocalyptic feel. As photographers, we are always striving to find novel perspectives on everyday scenes. Try photographing a city from a scenic overlook, the top of a skyscraper, or even a helicopter ride – for a view that even most residents of the city won't have seen. City skyline shots can be a bit of a cliche. Try capturing just the reflection of a waterfront city skyline and flipping it right side up, for a slightly surreal feel. Even more creative reflections can be found on the sides of mirrored high-rises, in puddles and in shop windows, creating an overlayed effect with the items inside. Photograph the mainland from the water, keeping the front of the boat in the frame. This is another of those techniques that can really make the viewer feel present in the moment. This works especially well with small boats, like canoes and kayaks, creating a very intimate connection between the viewer and the scene. It's tricky to get this kind of half submerged shot, but the results are worth it. Photo by Tracy Munson. 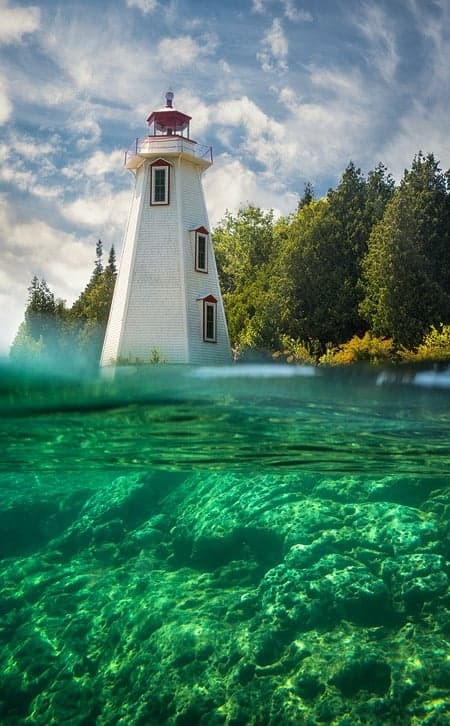 Better still, get right in the water with your camera and shoot back at the mainland with the lens half submerged. Every tourist will have photos of the palm trees on the beach, only you will have it from this perspective. If you can find some rocks, or a shell, or a friendly sea turtle to give some interest to the underwater part of the photo, that's a major added bonus. While a hard shell underwater case for your DSLR will set you back a bundle, these waterproof bags from Aquapac are an affordable alternative. When it gets dark, most tourists put away their cameras – at least for shooting landscapes. Modern DSLR's are capable of capturing incredible, detailed photos of the Milky Way, all you need is a rural area with little light pollution, a tree or a barn for some foreground interest and a flashlight for light painting. The same applies for cities. While you won't likely see the stars, there will be lights aplenty. This is a great opportunity to photograph light trails from cars. Once again, a high perspective will serve you well. There's little that evokes mystery like a winding path in the woods. If you can capture someone walking on the path ahead of you, it gives a great sense of scale and really helps the viewer place themselves right there in the scene. When we think of wildlife photography, most of us probably imagine grabbing the telephoto lens. While that certainly has its place, sometimes it's just as good (or better) to take a wider angle view that includes the animal's environment for context. Even relatively ordinary wildlife, like pigeons and squirrels can be interesting as part of a bigger composition. If you travel with your furry friends, of course, you will want to include them in your photos of iconic places and landmarks. Even if you weren't able to bring your own pets along, dogs and free-roaming cats can be great subjects for street photography. Just bear in mind that rabies is still quite prevalent in some countries, and treat any domestic animals you may encounter with the same respect and caution you would use with wildlife. 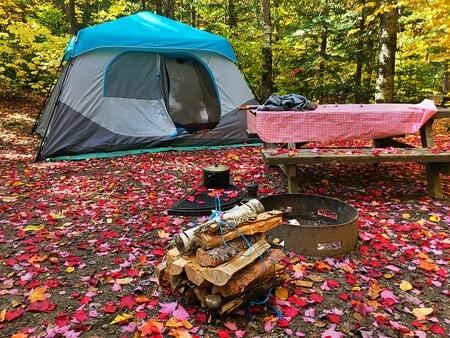 When camping, don't forget to take some shots that include your tent in the scene. Turn on a lantern inside, and it makes great foreground interest for a nightscape, too. Take wide-angle photos that show your feet in the scene. Try half submerged in sand and water at the beach, dangling from the end of a pier, setting off on a mountain path in your hiking boots, or on cobbled city streets in red strappy heels. Don't automatically reach for the wide angle lens for landscapes. Try using a telephoto sometimes. Especially if there are distant mountains that will be minimized by wide angle distortion, the longer focal length can be your friend. Sometimes, it's better to take a panorama with a long lens, in order to fit it all in, but still keep the mountains large in the frame. Neon signs. Old fashioned signs. Signs with bullet holes. Signs with…unfortunate English. Signs with funny place names. Crowded cities with a cacophony of signs, screaming for your attention. Don't ignore them, they can tell you so much about a place. In a worst-case scenario, they'll serve to remind you where you were because you won't remember what that place was called, years later. (Especially if the name is not in your native language). Another way you can set your photos apart from the crowd is to get out there and shoot, even when the weather is bad. City streets take on a completely different mood when they're running with water. Reflections are plentiful. Umbrellas can make for great interest in a scene. Most importantly, those moments of amazing light that happen when the clouds begin to break up, those happen FAST. You won't have time to grab your gear and get somewhere scenic if you're sulking in your hotel room, you need to be there NOW. Hopefully, these ideas will keep you busy on your next trip! If you made an effort to get at least one of each of these shots, you'd have the makings of a pretty awesome photo album, when you got home.